IAHR: 国際水理協会 [International Association of Hydraulic Research]の略. IAPO: 国際海洋物理学協会 [International Association of Physical Oceanographyの略]. ICCAT: 大西洋マグロ類保存国際委員会 [International Commission for the Conservation of Atlantic Tunasの略] (→　http://www.iccat.es/). ice: n.氷; (the ～)一面に張りつめた氷;　(I～)[北極地方の]氷原. v.(iced, icing)vt.…を氷で覆う[…over, up]、…を冷蔵する、冷やす、凍らせる、氷蔵する、vi.凍る[up]、氷が張る [例]to ice up fish: 魚を氷詰めにする. ／anchor ice, bottom ice, ground ice: 潜氷. ／drift ice, drift-ice: 流氷、浮氷 [例文] Drift ice will touch the Okhotsk coast of Hokkaido again and will flow into the Japan Sea. : 北海道オホーツク海側では流氷が再び接岸するとともに、日本海に流れ出すことになろう. ／ice field: [特に極地方の陸・海の]氷原、野氷、群氷 [参考](1)[海上の]小氷原: ice floe、(2)大浮氷群: icepack. ／ice bar, ice-bar: 氷堤(ひょうてい) [大陸沿岸の大陸棚上にできた氷で、これが分離して氷山になる]. ／iceblink, ice-blink, ice blink[単にblinkともいう]: [地平線付近の空に見える]氷映、氷光、氷原の反射光(cf. snowblink) [参考]氷映: 氷面の反射による雲の底面(下面)の輝き; 氷原の地平線上に漂う光. ／ice boat: 氷上ヨット[帆を張って氷上を滑走するスポーツ](→　ice yacht). ／ice cap: [極地方、高山などの]万年雪、万年氷雪、万年氷原(cf. ice sheet). ／ice floe: n.[海上の]小氷原(→ ice field); [表面が平原状の]浮氷、上面の平らな大きな浮氷、氷壁; 氷盤(ひょうばん). ／ice floes overtopping breakwaters: 防波堤を越波するice floes. ／ice front: n.氷崖(ひょうがい) [ice shelfなどの海に面した崖状の縁]. ／ice pack: [極海の]浮氷群(ふひょうぐん)、大浮氷群(pack ice)、叢氷、大浮氷原(pack ice). ／ice patrol [ship, vessel]: n.流氷監視・氷巡視[船]. ／ice plant: 製氷工場(施設)→ ice plant and cold storage: 製氷及び冷蔵施設. ／ice sheet: 大氷原、氷床 [極地などを覆(おお)う氷の厚い層; 現在も南極大陸やGreenlandで見られる内陸氷; cf. ice cap]. ／ice shelf, ice-shelf: 氷棚(ひょうほう)[ice sheetの海上に出た末端; 海をおおう氷床]、棚氷(たなごおり) [参照] ice front. ／ice yacht: 氷上ヨット(→ ice boat). ／sea ice: 海氷(かいひょう) [海の水が凍ってできた氷(frozen seawater)。氷山とは区別される]. ・　sea ice area concentration: 海氷域密接度. ・　sea ice condition chart: 海氷況図(状況図). ・　age of ice: 海氷の年代. ／to be iced up: [船が]氷に閉(と)ざされる. ／to ice up fish: 魚を氷詰めにする. ／The small lake was iced over. : その小さな湖に氷が張りつめた. iceboat, ice boat: n.[船]砕氷船(＝icebreaker); 氷上ヨット[帆を張って氷上を滑走するスポーツ; 帆・プロペラなどで氷上を 走る一種のヨット](iceyacht, ice yacht). icebound, ice-bound: adj. [港などが]氷に閉ざされた、氷で塞(ふさ)がれた、氷の張りつめた、氷結した; [船などが] 氷に閉じ込められた　[対語] ice-free [西語] cerrado por los hielos. icebox: n.アイスボックス [氷を用いる冷蔵用のボックス];　[一般的に]冷蔵庫;　[海][船の]冷蔵室. ／capelin, caplin: n.(pl. ～ or ～s)[魚]カラフトシシャモ [学名:　Mallotus villosus][鱈漁(タラ漁)の餌]、 シシャモ、[北洋産の]ワカサギ科の海産小魚 [鱈漁(タラ漁)の釣り餌(え)などに用いる]. ／whitebait(pl. -bait)[単複同形]; icefish(→ Salangidae); salangid; Salanx microdon: [魚]シラウオ(白魚). ice field: [特に極地方の陸・海の]氷原、野氷、群氷、氷原状の大浮氷 [極地の大陸上にある氷雪、あるいはそれと一帯をなして 海上に浮かぶ氷雪のフィールド・原野](→ ice floe) [参考](1)[海上の]小氷原: ice floe、(2)大浮氷群: icepack. ice fishing: n. 氷上での穴釣り(あなづり)、氷上漁、氷上での魚釣り、氷の隙間(氷隙)から魚を釣ること、氷上釣り、 アイスフィッシング　[湖などに張った氷・氷面に穴を開けて行なう、氷上からの釣り漁法]. ice floe: n.[海上の]氷原、小氷原(→ ice field); [表面が平原状の]浮氷、上面が平らで大きな浮氷、氷盤(ひょうばん). ice-free: adj.氷のない;　[一年中]凍らない、結氷しない、不凍の、氷の障害のない　[対語] icebound. ／an ice-free port:　n.不凍港 [冬期に結氷しない港]. icelining, ice lining: n.[海・船][船体の; 船首水線付近の] 対氷二重張り(→ ice doubling)、 [船首水線付近の外板に 重ねた]対氷保護外板(たいひょうほごがいばん)、アイスライニング. ice pack: n.大浮氷群(pack ice)、叢氷(そうひょう);　氷嚢(ひょうのう)(ice bag). ICES: 国際海洋探査協議会 [International Council for the Exploration of the Seaの略]. ice sheet: n.大氷原、氷床 [極地などを覆う層の厚い氷; 現在も南極大陸やGreenlandで見られる内陸氷; cf. ice cap]. ice shelf, ice-shelf: 氷棚(ひょうほう)[ice sheetの海上に張り出した末端部分; 海をおおう氷床]、棚氷(たなごおり) [参照] ice front. ／iceboat, ice boat: n.[船]砕氷船(＝icebreaker); 氷上ヨット[帆を張って氷上を滑走するスポーツ; 帆・プロペラなどで氷上を 走る一種のヨット](iceyacht, ice yacht). ichthyo-: pref. 「魚の」、"fish"を意味する連結形 [母音の前ではichthy-を用いる] [例] ichthyology:　n.魚学／ ichthyography:　n.魚類誌／ichthyosaurus:　n.魚竜／ichthyic:　adj.魚の、魚類の. ichthyolite: n.魚の化石(→ fossil of fish). ICNAF: 北西大西洋国際漁業委員会 [International Commission for the Northwest Atlantic Fisheriesの略]. ICSEAF: 南東大西洋国際漁業委員会 [International Commission for the Southeast Atlantic Fisheriesの略]. -id: suf. "dauthter of　…"を意味する名詞をつくる　[例] Nereid. idle: adj.→ idle pulley: n.遊び車(idler). idler: n.直外員 [船において、昼間当直を引き続き行う代わりに夜間の当直を免じられる乗組員;　甲板部・機関部に 属し航海当直をする乗組員以外の者で、船匠・コック・司厨員・倉庫係など]. idle shipping, idle tonnage: n.係船量、係船; 停係船. ／a laid-up ship, an idle ship: 係船、繋船: [繋がれた船のこと]. I flag: n.[国際信号旗の] Iの１旗信号 [「我左舷に針路を変じつつあり。本船左舷に変針中」を示す]. impel: vt.(-lelled, -pelling)…を押しやる、推し進める、推進する／impelling force:　n.推進力. ／The ship was impelled by the wind and tide. : 船は風と潮に押し流された. ／emperor angelfish[豪・NZ], imperial angelfish[豪・英国]: [魚]タテジマキンチャクダイ、ハマキンチャクダイ[キンチャクダイ科]. implement: n.器具、道具; 用具; (～s)用具一式／fishing implements: 釣り道具 [参考] equipment, implement (道具を意味する最も広義の語), instrument, utensil, applianceの区別. ／quota: 割当、分け前; 割当量(分)、分担(分配)額; 割当人数; [大学などの]定員. -inae: n.pl.suf. [読み方: アイニー][動]亜科(subfamily)を示す、亜科の名をつくる語尾(cf. -idae) [例]Felinae: ネコ亜科、 Caninae 犬亜科. ／subfamily: n.[生]亜科 [参考]suborder: 亜目(adj. subordinal). inanga: n.(pl.～;　～s)[魚]インナガ [ニュージーランド・豪州タスマニア産、南米南部産のGalaxias属の多種の 淡水魚]. ・　the inanimate world: 無生物界. ／azoic: adj. [動]動物の住んでいない、[地質]無生物時代の　[azoic: meaning "without animal life"]. inboard: adj. [海・空]船内の、機内の、船(機)の中心に寄った、adv.船内(機内)に(aboard)[西語: a bordo]、 船(機)の中央寄りに、n.内側(ないそく)発動機[付きの船]、[対語] outboard [参照] aboard. inboard-outboard: adj.,n. [小型船用の]船尾の推進機と連結した船内発動機の[付いた船]、船内発動機連結 船外推進船の[船](→ stern drive). [文例]After a container is unloaded, it is refilled with items like specialty grains, pulp or lumber, which are exported as backhaul cargo. ／homebound, home-bound: adv.本国に向かって[いる]、本国行きの; 帰航の、復航の(cf. homeward-bound). ・　to be homeward-bound: [船が]本国へ帰る. ／banded dogfish: n.[魚]ドチザメ; Triakis scyllia. incident wave: n.入射波(にゅうしゃは)／incident angle: 入射角. inclination: n.傾差; [地磁気の]傾角／inclination experiment: n.[船体の]傾斜試験. increase of meshes: n.増し目／increasing meshes: [網地の]増し目. ／The coastline is indented by the sea. : 海が海岸に入り込んでいる. ／a coastline full of indentations: 出入りの多い海岸線. ／solo operating catcher boat affiliated with a fleet: [母船付属の]独航船. ・　a day's coastal whaling by a solo operating catcher boat not affiliated with a fleet: [文例]独航のキャッチャー ボートによる日帰りの沿岸捕鯨. index error: n.[計器目盛の]指示誤差、器差 [略: I.E.]. ／index error of sextant:　六分儀の指示誤差、六分儀器差(instrumental error) [動鏡と水平鏡が平行のとき、インデックスバーが 示す零度からの偏角]. Indian Ocean Fishery Commission: n.インド洋漁業委員会 [略: IOFC]. Indian spring low water: n.インド(印度)大低潮面; 略最低低潮面. indicator species: n.指標種／indicator指標／bioindicator species: 生物指標種. induced: →　induced fish breeding: 誘発魚類繁殖／induced spawning: 誘発産卵. infauna: n.[動]埋在(内生・内棲(ないせい))動物[相]、インファウナ [底質中で生活している動物[相]; cf. epifauna]. ／a coast infested with pirates: 海賊が横行する沿岸. inflatable liferaft, inflatable life raft: n.膨張いかだ、膨張式救命いかだ. ingoing: adj.入って来る(cf. outgoing)／an ingoing ship: n.入港船／the ingoing tide: n.入り潮. I, N, I flag: n.[国際信号旗の] I、N、Iの３旗信号 [「救命艇」を示す]. ／departure course:　起程針路(→ great circle sailing, composite sailing); 出発針路. ink bag: n.[イカの]墨汁嚢(ぼくじゅうのう)(→ ink sac)／ink gland: 墨汁腺. ink sac: n.[動][イカの]墨汁嚢(ぼくじゅうのう)、墨袋(→ ink bag). inland sea: n.内海(ないかい)、縁海(えんかい) [大陸棚の上に広がる海]; [the I～ S～]瀬戸内海. inland water: n.陸水、内水;　(pl. )[the ～]内水[河川・湖沼・湾など一国内の水域]; 内水面. Inland Waters Fishing Ground Administration Commission: n.内水面漁場管理委員会[日本]. inlet: n.入り江、入り海、入江、入海(いりうみ); [島と島との間の]小海峡 [参考]入り江:　海や湖が陸地に 深く入り込んだところ。入り海　[参照]bay; cove. ／the right of innocent passage: 無害通航権. INPFC: 北太平洋国際漁業委員会[International North Pacific Fisheries Commissionの略]. inshore: adj.海岸に近い、近海の、沿海・沿岸の(opp. offshore)[西語: cerca de la coasta]、海岸に向かう、 陸の方へ、海岸に近づく、adv.海岸で、近海で; 海岸に向かって. ／inshore current: 海浜流 [対語: offshore current]. ／inshore fishery: 近海漁業、沿海漁業 [対語: offshore fishery] [参考] coastal, littoral, near-shore, mid-shore, offshore. ／The boat went closer inshore. : ボートはだんだん岸の方へ接近して行った. ／The ship lay inshore. : 船は岸の近くに停泊していた. inside cabin: n.[客船などの]有窓(窓のある)船室(客室、キャビン) [対語] outside cabin: 無窓(窓のない)船室(客室、 キャビン). in situ: 現場／density in situ: [海]現場密度 [海水が所在する現場での密度]. inspection: n.検査、査察／inspection vessel: n.監視船(→ patrol boat)／inspector:　n.検査官(員)、査察官. ／instant dispatch(killing) for freshness-keeping: n.活け締め(いけしめ)、即殺、活け締め(いけじめ)[鮮度保持の目的で生き魚から 血を抜くこと; to let out the blood from a live fish for the purpose of preserving its freshness [prior to cooking]]. [参考]活け締め: (1)生きた魚を出荷する前の数日間、その魚に給餌しないこと; (2)生け簀で飼育してきた魚を調理する 直前に殺すこと(to kill fish immediately before cooking). ／to let out the blood from a live fish for the purpose of preserving its freshness [prior to cooking]: 活け締め [鮮度保持の 目的で生き魚から血を抜くこと]. insular: adj.島の、島に棲息する; 島に住む、島にある; [島のように]孤立した(isolated); 島国根性(insularism)の、 偏狭な、狭量な(narrow-minded). ／insular shelf; island shelf: 島棚(しまだな)、海棚、島嶼棚 [島・群島周縁にある勾配の少ない、水深約200m以浅の海底]. intake: 取水→ seawater intake system: n.海水取水システム. Inter-American Tropical Tuna Commission: n.全米熱帯マグロ類委員会 [略: IATTC]. intercardinal points: n.四隅点 [コンパスの東、西、南、北の各中間の４つの方位点、すなわち北東、北西、南東、 南西(NE, NW, SE, SW)の方位点をいう]. intercoastal: adj.両岸間の; 大洋連絡の／intercoastal shipping: n.両岸間の海上輸送. intercooled layer: n.中冷層(→ dichothermal layer; intermediate cold layer). intercooled water: n.中冷水(→ intermediate cold water; dichothermal water). Intergovernmental Maritime Consultative Organization: 政府間海事協議機構 [IMCO][現在はIMOに改組されている]. Interim Convention on Conservation of North Pacific for Seals: n.北太平洋オットセイ条約. ／an inter-island ferryboat route: n.島嶼間フェリー航路. intermediate cold layer: n.中冷層(→dichothermal layer; intercooled layer). intermediate cold water: n.中冷水(→dichothermal water; intercooled water). ／intermediate vessel(ship); mixed vessel(ship): 貨客船. intermediate warm layer: n.中暖層(ちゅうだんそう)(→ mesothermal layer). intermediate warm water: n.中暖水(→ mesothermal water). internal tagging method: n.[魚の]内部標識法 [参照]標識. international canal: n.国際運河 [運河領有国との条約によって国際化されている運河。スエズ、パナマ、キール運河が これに属する]. International Code: n.[the ～][船舶などで用いる]国際船舶信号; [the ～]国際共通電信符号. 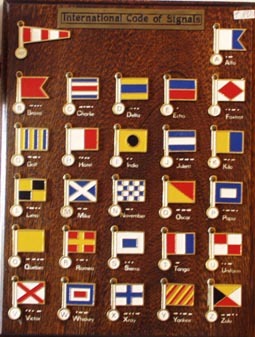 ／international signal flag; international code flag: 国際信号旗　[文字旗(26旗; letter flag)、数字旗(10旗; numeral flag)、 代表旗(3旗; representative flag)、回答旗(1旗; reply flag)からなる]. 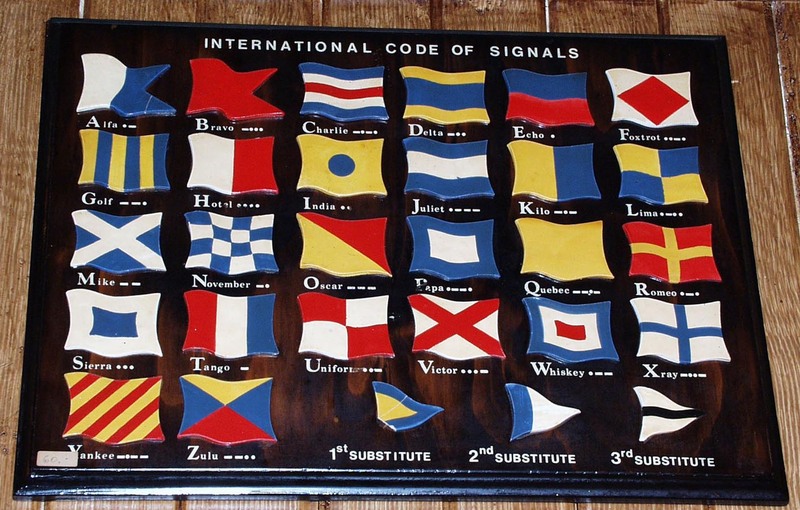 International Code of Signals: n.国際通信書 [International Code of Signals] [画像参照] 画像(1)～(4) [西語: Código Internacional de Señales]. International Commission for the Southeast Atlantic Fisheries: n.南東大西洋国際漁業委員会. International Convention for the Conservation of Atlantic Tunas: n.大西洋マグロ類保存条約. international Convention for the Prevention of Pollution of the Sea by Oil: n.油による海洋汚染防止条約. International Convention for the Safety of Life at Sea: n.海上における人命の安全のための国際条約. International Convention on Oil Pollution Preparedness, Response and Cooperation, 1990: n.[略] OPRC. International Convention on Standards of Training, Certification and Watchkeeping for Seafarers, 1978: 1978年の 船員の訓練、資格証明および当直の基準に関する国際条約 [略: STCW Convention]. International Council for the Exploration of the Sea: n.国際海洋探査委員会. International Court of Justice: n.国際司法裁判所 [略: ICJ][所在地: オランダ、ハーグ]. ／the International Code: [the ～][船舶などで用いる]国際船舶信号; [the ～]国際共通電信符号. ／International Code of Signals: 国際信号書 [航海および人命の安全などに関する信号の方法と手段を収録した国際的な取り決め書] [画像参照]画像(1)～(4) [西語: Código Internacional de Señales]. International Hydrographic Bureau: n.国際水路局[略: IHB] [注]後に、IHO(国際水路機関)と改名された. International Load Line Certificate:　国際満載喫水線証書 [国際満載喫水線条約に基づいて、国際航海に従事する長さ24メートル 以上の船舶に交付される証書]. International Load Line Convention: n.国際満載喫水線条約 [満載喫水線に関する国際条約]. international nautical mile: n.国際海里 [参考]１国際海里(１ n.m.): 1,852メートル、または6,076.11549 (約6,076)フィート. International North Pacific Fisheries Commission: n.北太平洋国際漁業委員会. International Ocean Institute: n.国際海洋研究所 [所在地:　マルタ(Malta)]. International Pacific Halibut Commission: n.太平洋オヒョウ国際委員会. 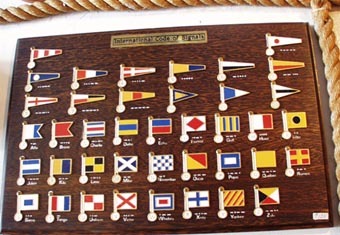 International Sail Training Association: n.国際帆船訓練協会. 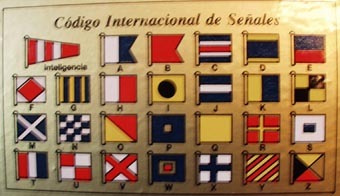 international signal flag: n.国際信号旗 [文字旗(26旗; letter flag)、数字旗(10旗; numeral flag)、 代表旗(3旗; representative flag)、回答旗(1旗; reply flag)からなる]; international code flag. international strait, strait used for international navigation: n.[海洋法]国際海峡. international tonnage certificate, International Tonnage Certificate: 国際トン数証書 [西語] certificado internacional de arqueo. International Tribunal for the Law of the Sea: n.国際海洋法裁判所. International Union for Conservation of Nature and Natural Resources: n.国際自然保護連盟 [略: IUCN]. International Whaling Agreement: n.国際捕鯨協定 [略: IWA]. International Whaling Commission: n.国際捕鯨委員会 [略: IWC]. International Whaling Regulation: n.国際捕鯨規則 [略: IWR]. interstitial water: n.間隙水(cf. pore water). [英語] intertidal: [参考]that portion of the eulittoral zone found between high tide and low tide levels. ／intertidal zone; tidal zone: n.[海]潮間帯 [高潮線と低潮線の間]. ／mediolittoral zone; eulittoral zone; midlittoral zone; littoral zone; intertidal zone: 潮間帯. intertropical: adj.両回帰線間の、熱帯地方の／indertropical convergence zone: n.熱帯収束帯. Intracoastal Waterway: [the ～][小型船舶用の]内陸大水路 [ボストンとフロリダ湾間のAtlantic Intracoastal Waterway、 及びフロリダ州Carrabelleとテキサス州Brownsville間のGulf Intracoastal Waterwayの２つから成る]. inversion: n.→ inversion of water temperature: 水温逆転. invertebrate: n.[動]無脊椎(むせきつい)動物 [参考] invertebrate: Animal lacking a backbone; Large group of animals, including insects, mollusks, and crustaceans, that have no backbone or internal skeleton. invisible load: material transported in solution in stream water. Invincible Armada: n.[the ～][史][スペインの]無敵艦隊(Spanish Armada) [1588年英国艦隊に破れた]. ／armada: n.(A～)スペイン無敵艦隊(＝the Spanish Armada, the Invincible Armada) [1588年イギリス艦隊の撃滅を謀ったが 大敗に帰した]; (a～)艦隊; [漁船などの]大集団. IOFC: インド洋漁業委員会[Indian Ocean Fishery Commissionの略]. ／in irons: [海][帆船が帆と風向きの関係で] 操船不能になって、帆船が風上に船首を向けて回頭不能の状態にあること; [船が]金縛り状態で;　足かせ(手かせ)をはめられて. Irrawaddy dolphin: n.[動]カワゴンドウ、イラワジ・イルカ, Orcaella brevirostris Owen[鯨目・カワゴンドウ科]. irregular sharped pen shell: n.[貝]カゲロウガイ. isinglass: n.にべ、アイシングラス(＝fish gelatin, fish glue)、魚にかわ[魚の浮き袋から作ったもの];　雲母(うんも). island: n.島／an out island: n.離れ島. island arc: n.島孤(とうこ) [group of islands surmounting a seaward-convex submarine ridge]. island arc trench: [参考]trench lying on the seaward side of an island arc. island shelf; insular shelf: n.島棚(しまだな). isobar: n.[気・理]等圧線、イソバール [lines on a weather map joining places of equal atmospheric pressure;　大気・海洋の断面において圧力の等しい点を結んだ線]. ／an isobar; an isobaric line; an isopiestic: n.[気]等圧線. isobath: n.[海]等深線(とうしんせん) [line connecting points on the ocean floor having equal depth beneath the water surface](→ isobathymetric line). ／bathymetric chart: n.深浅図、水深図、等深線図 [参考]A bathymetric chart indicates ocean depth by use of lines called isobaths. Isobaths are sometimes called underwater contour lines. ／bottom contours: 海底等深線 [参考](1)主曲線: 縮尺によって異なるが、通常実線で引かれる; (2)間曲線(intermediate contour): 主曲線の間に破線等で引かれる. ／depth chart:　水深図(→ bathymetric chart). ／depth contour: n.等深線(→　isobath, depth curve). isobathyic:adj.→ isobathyic line; contour line: n.等深線／isobathic chart: n.等深線図. isochromatic line [of the sea]: n.等水色線(とうすいしょくせん). isotherm: n.[海・気]等温線 [海洋・大気の断面において温度の等しい点を結んだ線](→ isothermal line). isothermal: adj.→ isothermal line: n.等温線. ／the Isthmus of Suez(Panama): n.スエズ(パナマ)地峡. mako: n.(pl.～s)[魚]アオザメ、青鮫(あおざめ)[マオリ(Maori)語]; mako shark; bonito shark; mackerel shark; [豪]blue pointer; Isurus oxyrinchus. I, U flag: n.[国際信号旗の] I、Uの２旗信号 [「我該水道の海図を求む」を示す]. ／ivory shells, whelks, Buccinidae: n.[貝]エゾバイ科 [腹足綱・新腹足目の１科]. IWA: n.国際捕鯨協定(International Whaling Agreement) [1946年捕鯨関係15か国が署名、1948年発効]. IWC: n.国際捕鯨委員会 [International Whaling Commissionの略]. IWR: n.国際捕鯨規則 [International Whaling Regulationsの略; IWAに付属する規則]. I, X, Q flag: n.[国際信号旗の] I、X、Qの３旗信号 [「サバ」を示す].